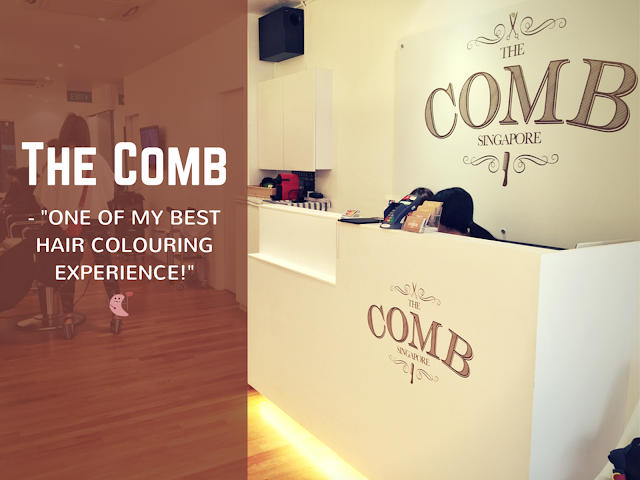 Best Hair Colouring Experience at The Comb Hair Studio! "The Comb Hair Salon? Why are you going to a salon just to comb hair Evilbean?" ERRRRRRRR. Well, I wouldn't blame you for asking that. I also thought the salon that I was going to have my hair coloured was called The Comb Hair. This Korean-style hair salon is helmed by a team of Korean hairstylists, with the creative director, Rina, having more than 15 years of experience under her belt, styling for celebrity boybands and models such such as ZE:A and Lee Jin Wook. If you are as fanatical about K-pop as me, you would probably be squealing a little right now. With such a team, I was assured that my hair would be in good hands, because I can be really picky about the way my hair should be styled. Having had black hair for quite a few months, I was really excited to finally get some colour on my hair. I made my way down to the salon, which was just a few minutes walk away from Telok Ayer station. They had a beverage menu, which was EXACTLY what I needed because the weather was scorching hot that day. I would have usually go for the coffee, but that day, that refreshing cup of iced orange juice that I picked thoroughly lubricated the Evilbean. My hairstylist was Stephanie, who explained the style she envisioned for me in detail. It is a nightmare to be my hairstylist because I have very dry and wispy hair. Plus the fact that I have been continuously dyeing my hair black, I knew it was going to be a challenge to get colours onto my hair without bleaching. The whole colouring experience was comfortable. You know how some dye products seem to feel like they are slowly eating and dissolving your scalp the moment you apply them? Like you would scream for them to "STOP EATING MY SCALP" and the ingredients in the dye would sting you even more? Well, not with these dye The Comb was using. There wasn't any stinging sensation on my scalp at all! I had magazines, TV and drinks to entertain myself with and before I knew it, it was time for the wash off, and OH MY GOD, I had one of the best head massage! I did not get the guy's name that did the washing for me but wow. His hands, his strength and his massage techniques were heavenly! Annnnd here's my new hair colour! I really like how the colour turned out as dye colours can be quite hard to show on hair that has been dyed black. And the most amazing thing? Look at my hair. They felt so much smoother, as if I just had a hair treatment! Although this was sponsored, I sincerely recommend this Korean hair salon. JJANG ! Thank you @combsalon and my hairstylist Stephanie for my new hair! Yes, like I commented on my Instagram post, my hair felt so much smoother, as if I just had a hair treatment! If you dye your hair regularly, you would know that your hair becomes really dry and frizzy after the dye as some products have really harsh chemicals. My hair colouring experience at The Comb was so different. No stinging sensation and my hair became smoother. One of the best hair colouring salon? Experience it yourself and tell me. Thank you The Comb Hair Studio and my hairstylist Stephanie for my new hair again! You can also follow them at their Instagram @combsalon to check out the different styles created by them on happy customers!